Here it is, my first J. Springs. 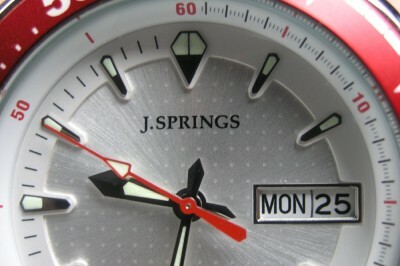 It is made by SII, Seiko Instruments, Inc. J. Springs is short for Japan Springs. SII happens to make all of Seiko’s springs and advanced alloys. Every other watch manufacturer relies on Elnivar (an alloy and the name of a company) for the special metal used to the balance wheel spring of a watch. Seiko being Seiko, makes their own version, called SPRON 300, in their own factories. So if Elinvar goes bye bye, Seiko can still make mechanical watches. So I digress, back to this particular watch. As you can see here, it has a signed crown, which is unusual for watch at this price point (comfortably under $100.) 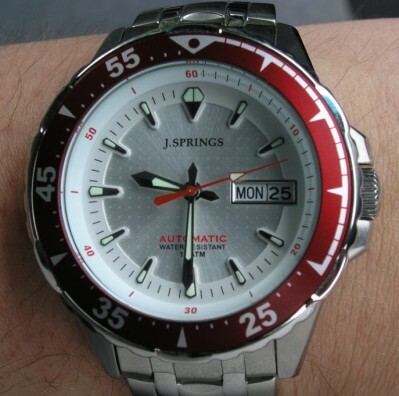 The body of the watch is a all brushed, with the crown and the bezel have a high polish. The crown is at the conventional 3 O’Clock position, unlike Seiko 5’s and has large crown guards. The watch does not hand wind, since it is a based on the Seiko 7S26B aka the Y676B. The band and clasp are really exemplary for a a sub $100 watch. The links are solid and the clasp is a signed push button with a safety clasp. It does not pinch at all and does not grab hairs. 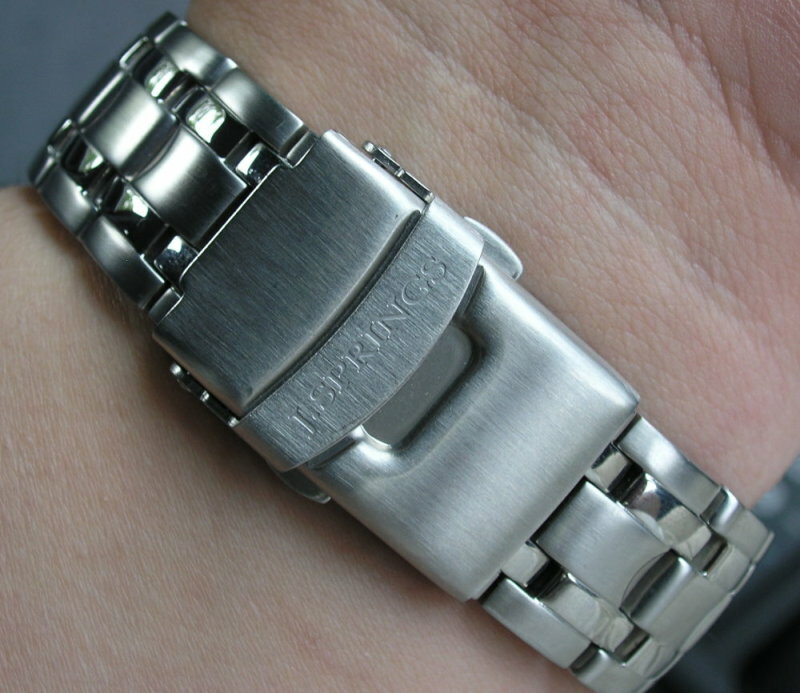 The bracelet is brushed except for the two bands. It compliments the brushed and polished case well. The face of the watch is very detailed. It is a radiall sunburst with a grid of matte dots. The hands are a classic style are filled with some Lumibrite. The markers and hands have a high polish and are placed flawlessly. 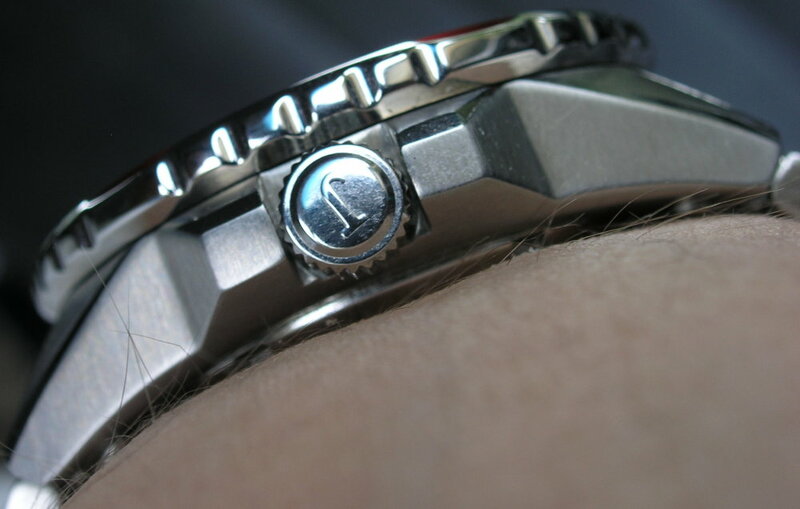 The chapter ring has marking at 1/5 of a second intervals up to 20 seconds, then every ten minuted thereafter. It makes a for a very modern look. The crystal is domed and perfectly polished. Case: 41.5mm diameter, 14mm thick, stainless steel, 100m water resistance. Movement: Automatic, Y676N, Seiko in-house design, 21 Jewels. No handwind or hacking. Based on 7S26B. Other: Lumibrite, 120 click unidirectional bezel.. Overall, I really like this watch. It is surprisingly easy to read, even with silver hands and a silver face. I think my only complaint would be the lume is pretty weak. It glows brightly to begin with, but dims rapidly. The watch is very accurate (+8 seconds a day) and although heavy, is not hard to wear all day long. It’s a real keeper and a great find by Tiffany, my lovely wife.